It's been many moons since I have had a clear sky night - we hads two nights - then more rain - bah humbug! I used those two nights to image NGC2174....i combined images taken with a SV70T and AT65EDQ - both using ASI1600MM-C cameras and Astronomik NB filters. I had 4 hours each night for each kit - a total of 16 hours over the two nights. I combined 180 second images and ended up keeping and staking Ha, 60 Oiii, and 50 Sii. 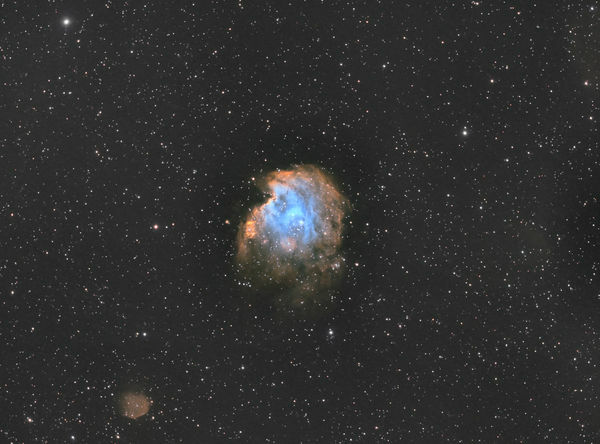 I used Nebulosity 4 to grade the images (instead of SGP) and threw out a bunch. I kept 210 (10.5 hours) and processed in SGP. 20 darks, 150 flats, 100 bias for each kit were the supporting files. The deluge continues here. 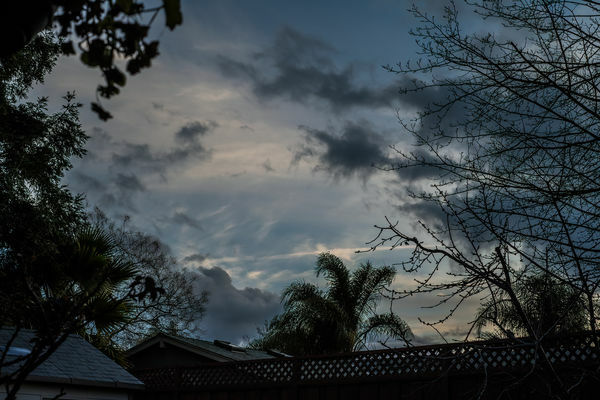 Last night was the closest we have come to seeing the sky in a long time and I post a picture just before sunset just because it momentarily stopped raining. Once it was dark, the sky was totally clouded over again. And its rained all day again today. I am trying not to complain - we have had a lot of rain but our weather is manageable......unlike many in the midwest and northeast and far west. If all goes as planned......next week will feature the sun and clouds during the day. The nights still look mostly cloudy but seeing the sun - as opposed to successive overcast days with drizzle and downpours - will be welcomed! This last year was the rainiest in 35 years - or so our weatherperson said. Right there with you (actually an hour north) with the lousy weather. Got out one of those two nights, guests for the other ... Of course! I got a nice shot of Orion, but spent more time with the new CPWI software for the mount. I think Monday looks like it should be clear! Excellent image! Good use of narrow band imaging opportunities. The weather here in Southern Arizona has provided few imaging windows as well. You need to jump in! Like everything else, there is a learning curve. I got a telescope from my son 7 years ago and it, along with the mount, stayed boxed in a closet for a year. After a surgery, I was confined to rest I opened the stuff up and started reading the manual. As soon as I was able to carry it around....I set up up on our back deck and tracked the moon visually. That was all she wrote. Now I am a dead broke, so so, dark sky imager. In fact, I now have my social security check direct deposited at "HighPointScientific" :).....this is where I have purchased the lion share of my stuff. Ed , this weather has been nasty for so long . The nights that I've been able to get out has been spent on getting my rig back to where it used to be before breaking the Declination motor casing doing a plate solve on Rigel. I'm swapping parts from my older lxd55 mount that now has a weight limit of 1/2 the max load. I can't understand why the plate solve took it so far and wanted to run into the tripod plate . I guess I should've set the meridian flip to before the meridian rather than at the meridian , it does stick out a couple inches more than the factory base . I love what you're catching and I'm jealous as ---- but, I'll be out there hopefully soon and get more testing done. OK, you guys quit showing off... The best I can do, is push in on my eyeballs and watch the light show. Oh, sure, I can spot the Big Dipper without much help and, if up, know the moon irrespective of phase... but all this "meridian flip," "lxd 55", "ASI1600MM-C" and such just makes me want to go eat cupcakes and watch cartoons. You guys are fantastic. Nice Ed, good use of the dual setup.